The planned meeting came amid growing outrage over the men's arrest and a second day of protests in the City of Brotherly Love. The CEO of Starbucks on Monday met with two black men who were arrested at one of his shops in Philadelphia, as accusations of racism grew against the mammoth coffee chain. The quickly planned meeting came amid a second day of protests in the City of Brotherly Love, after video of the two getting arrested on suspicion of trespassing went viral. A spokesperson for Starbucks confirmed to NBC News that the private meeting with CEO Kevin Johnson happened on Monday but no additional details were immediately provided. He also said he will order store managers to undergo training on how to spot "unconscious bias" — something that has been implemented in many police departments across the nation as well as other corporations, such as Facebook, to help educate employees not act upon subconscious stereotypes. Previously, Johnson appeared in a video apologizing to the men and promising changes at the company. The two men, whose identities have not been released, were arrested Thursday after a Starbucks manager called 911 because they were sitting inside the store, had not bought anything and refused to leave, according to police. The store manager who called police "is no longer at that store," a Starbucks spokesman told NBC News Monday afternoon, but did not give any further detail. It was not immediately clear whether the manager had been fired. About two dozen protesters gathered outside the coffee shop in the pouring rain, starting before 7 a.m. on Monday, alleging racism by both the baristas and the police. Inside the store it looked like business as usual, however most of the people sitting at the tables were regional leaders from the company's corporate side, according to The Associated Press. 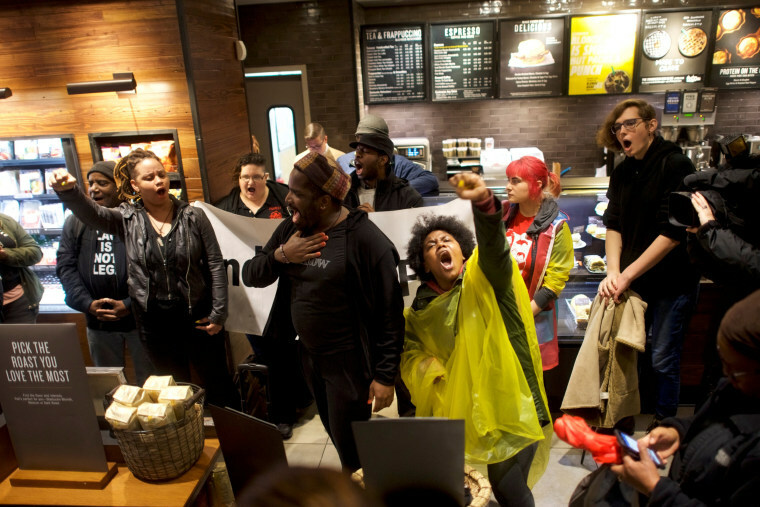 Just before 7:30 a.m., the protesters moved inside and stood in front of the counter, some holding banners reading "End Stop and Frisk" and chanting slogans like, "A whole lot of racism, a whole lot of crap, Starbucks coffee is anti-black." Protester Shani Robin told NBC News that the demonstrators want the manager who called police and the arresting officers fired. “If you can’t even go into a Starbucks to wait for a friend to come, you’re not safe anywhere,” she said. “We're going to occupy space, we're going to make it very uncomfortable until they make changes and until specifically they meet the demands we set forth,” Robin added. Another protester, Abdul-Aliy Muhammad, toldthe AP, "We don't want this Starbucks to make any money today. That's our goal." While in Philadelphia on Monday, Johnson, the Starbucks CEO, met with Mayor Jim Kenney and other city leaders. Kenney told reporters after the meeting that he was happy that the company met with officials and that Starbucks was "contrite." "They're going to examine their guidelines and make sure that this doesn’t happen again and they were very contrite and sorry for what happened, and we’ll work with them going forward," he said. Councilman Kenyatta Johnson said during a news conference that he would "wait and see" if the company actually implemented change. "To me it was all lip service. I'm not sold," he said. The councilman, who is black, added that he wanted to "see an actual plan" to ensure that people could go to Starbucks "without fear of being targeted because of their skin color." Also on Monday afternoon, the NAACP said in a statement that the arrests represented "another ominous signal on the increasingly dangerous environment for African-Americans." "The Starbucks situation provides dangerous insight regarding the failure of our nation to take implicit bias seriously," the NAACP said. On Sunday, demonstrators carried megaphones and signs with phrases like “Too Little Too Latte” and confronted the employees behind the register, according to NBC Philadelphia. Philadelphia Police Commissioner Richard Ross, who is black, said Saturday that the men hadn't purchased anything and refused to leave, which led to the arrest. The men were eventually let go after about eight hours in police custody; Starbucks did not press any charges. Michelle Saahene, who witnessed the incident, told NBC News on Sunday that after the men were not permitted to use the bathroom because they had not purchased anything, they sat at a table silently while using their phones as they waited for a friend. "The cops were asking them to leave because they weren’t purchasing anything," Saahene said. "This is a Starbucks. Since when are people asked to leave a Starbucks who are just sitting there?"